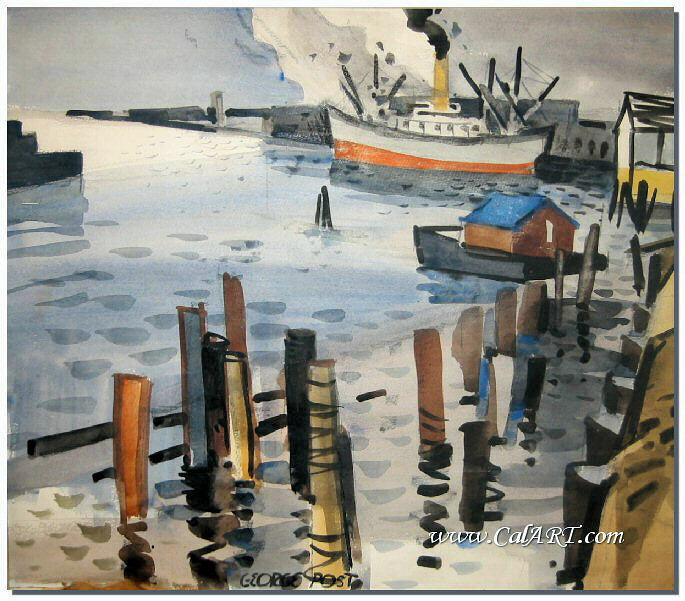 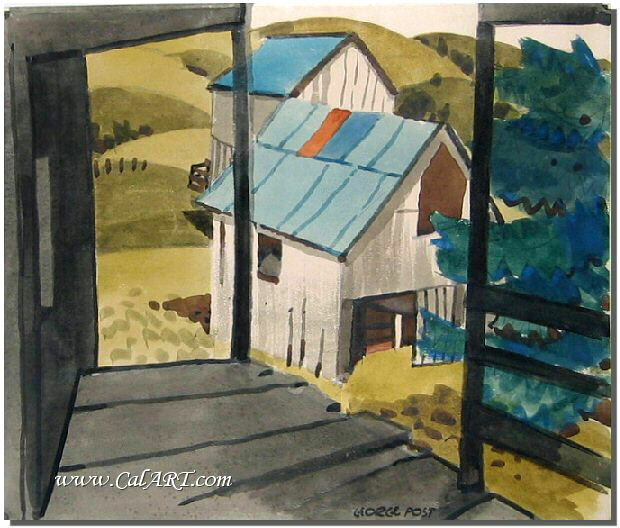 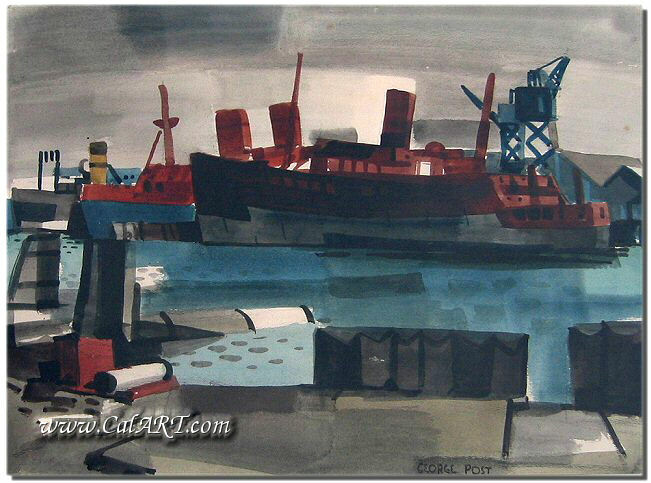 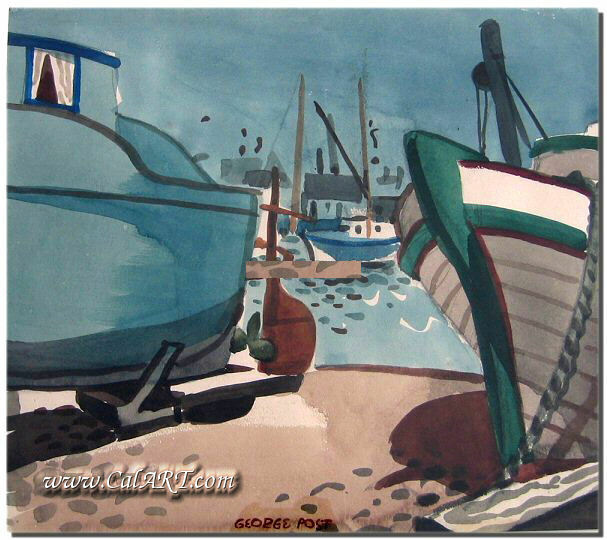 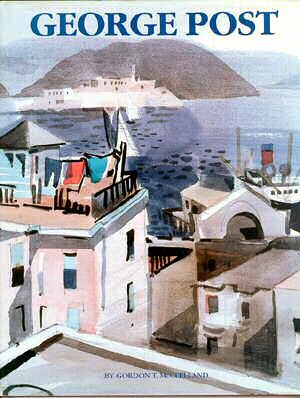 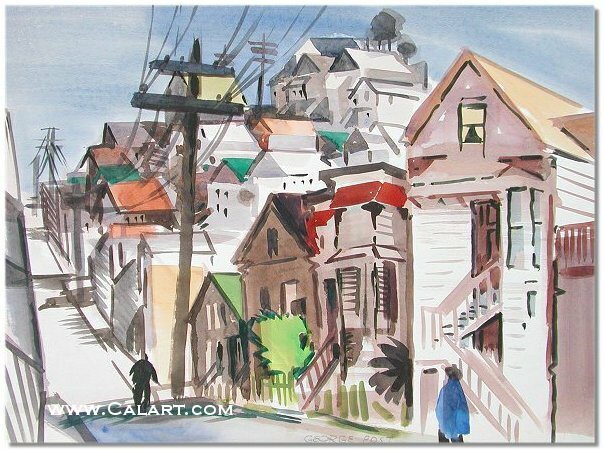 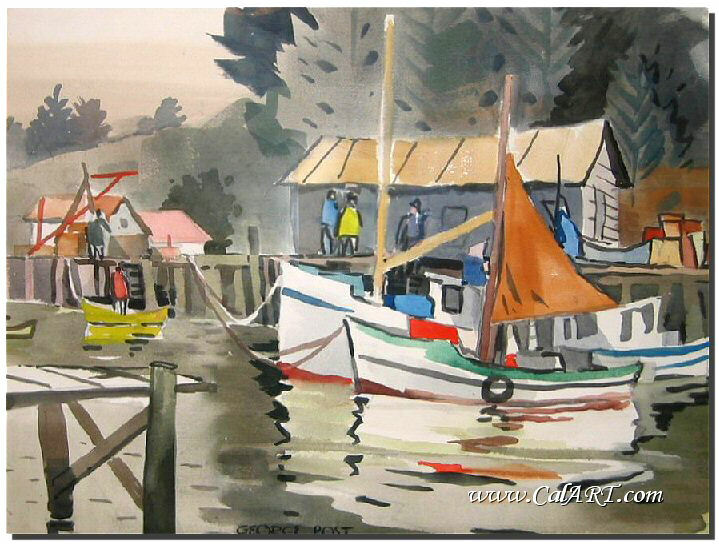 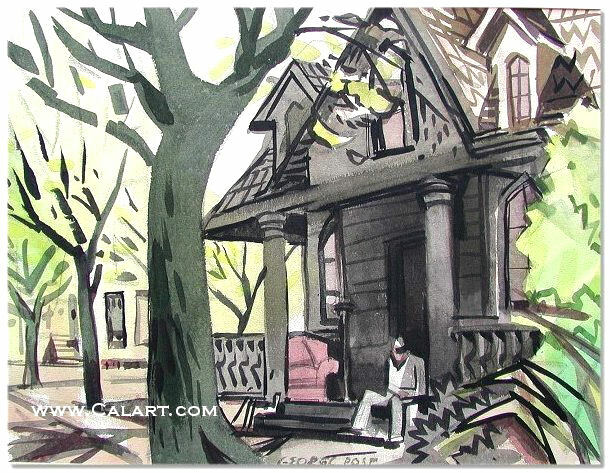 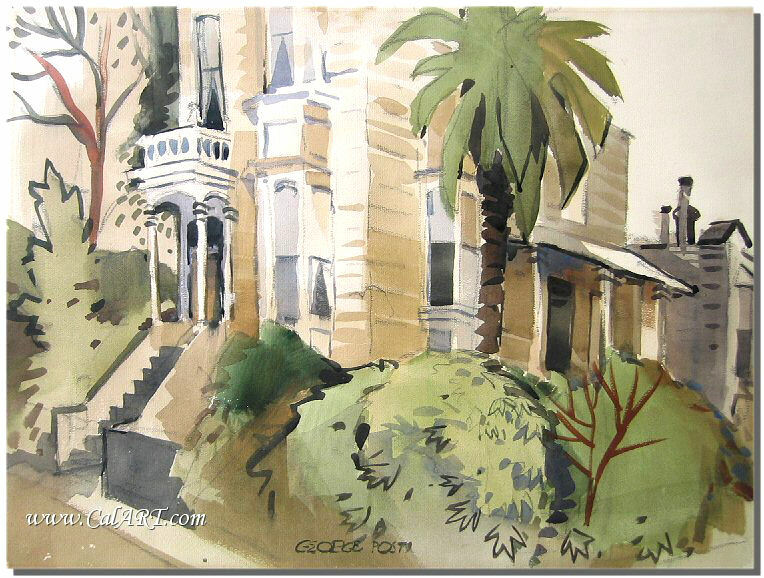 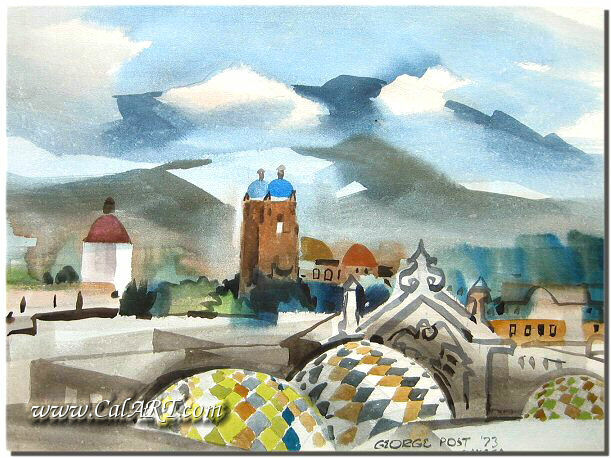 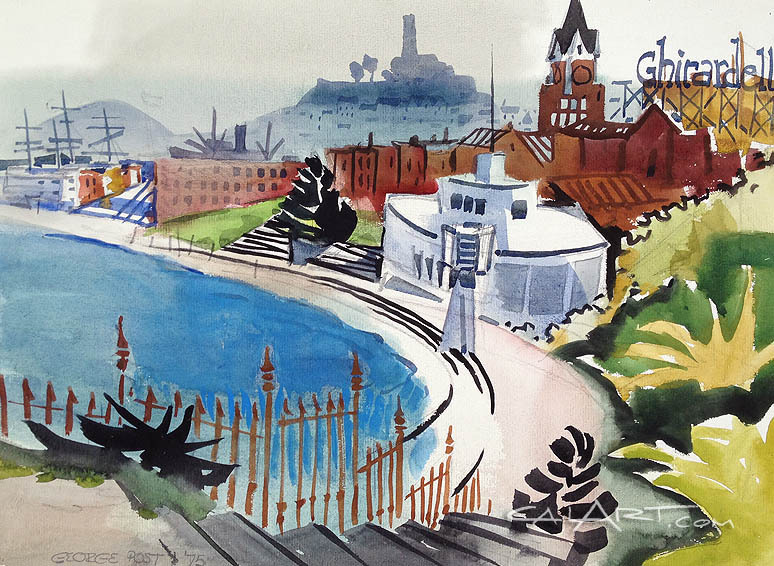 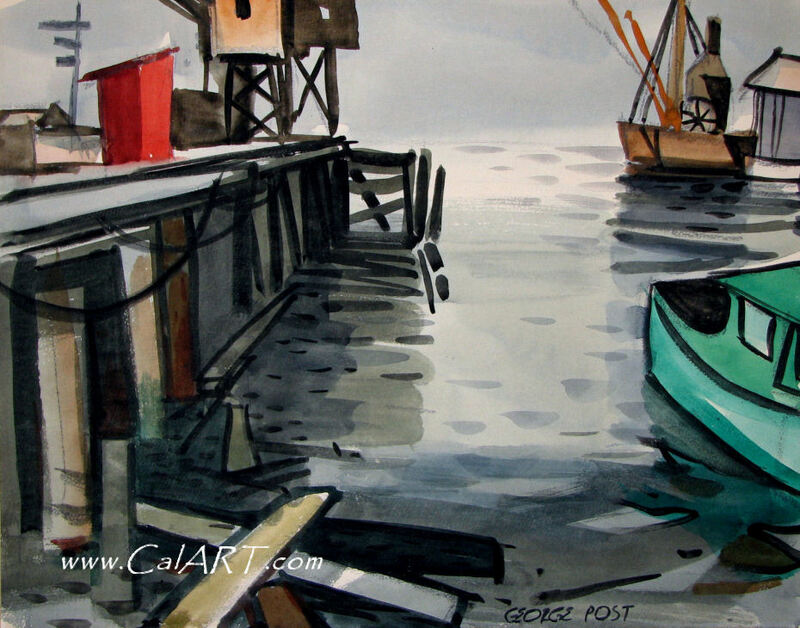 George Post, California Watercolor Painter (1906-1997). 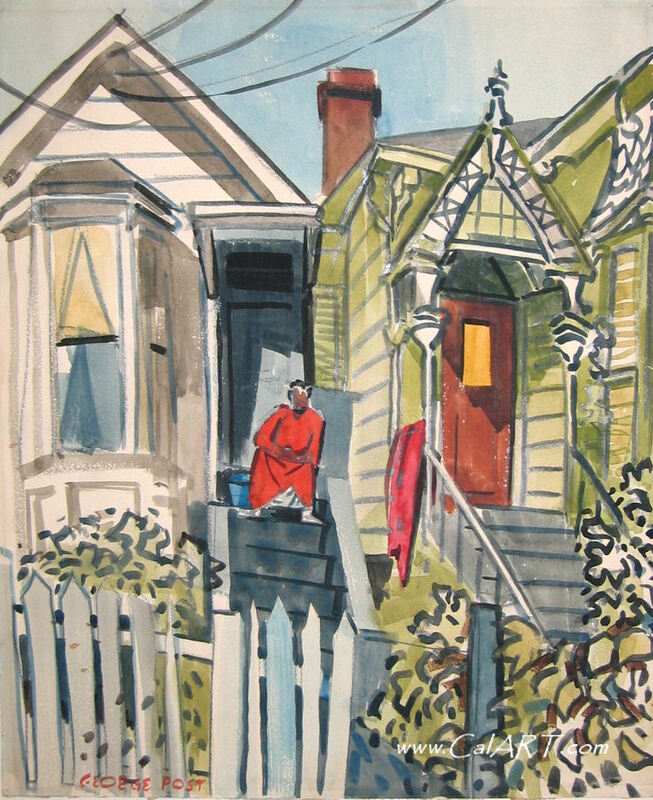 George Post was born and raised in Oakland, California. 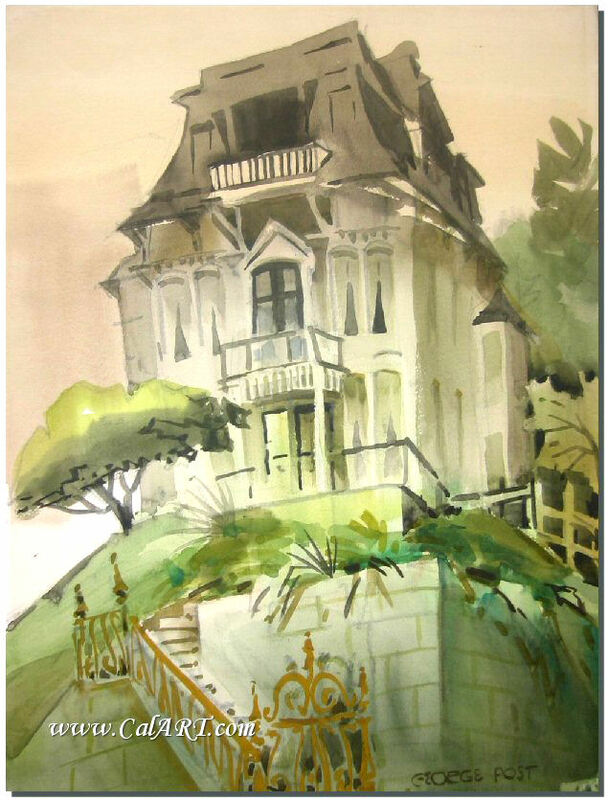 STUDIED: California School of Fine Arts (San Francisco), Academie Frochot (Paris). 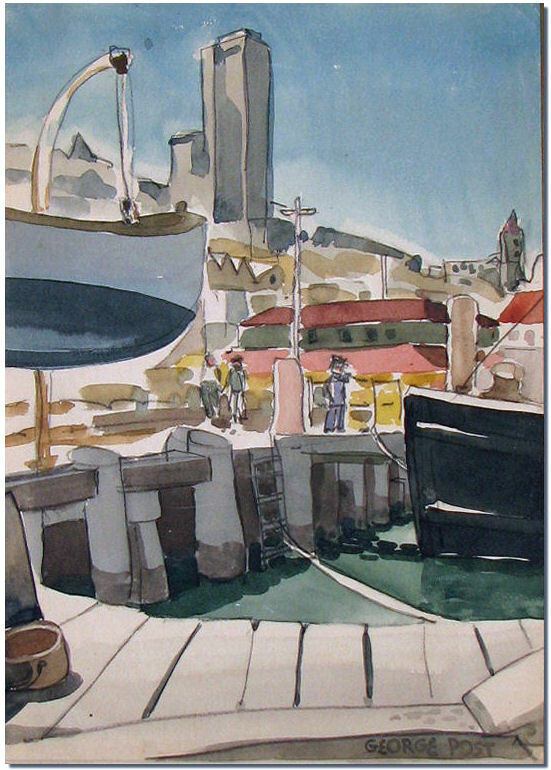 MEMBER: American Watercolor Society, California Water Color Society. 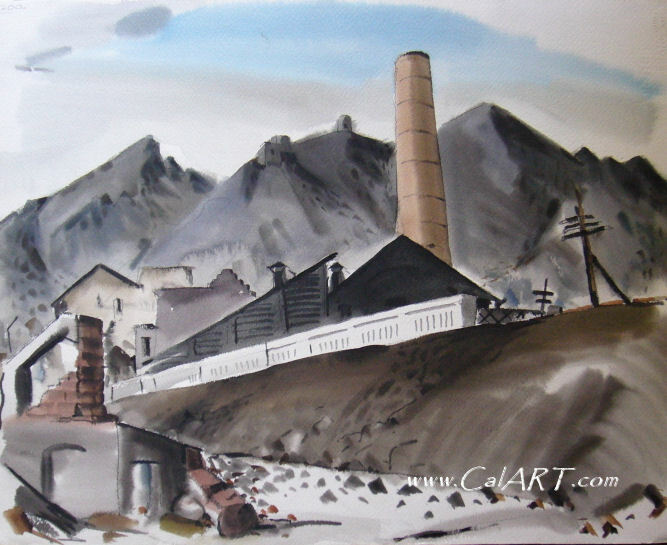 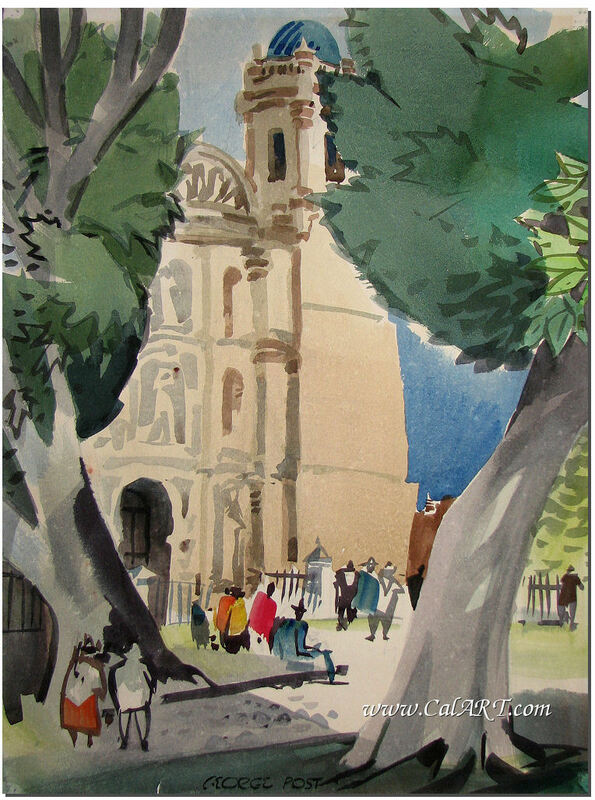 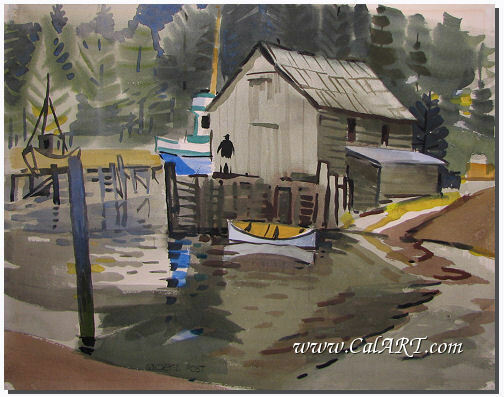 George Post biography provided courtesy of �California Watercolors 1850-1970� By Gordon T. McClelland and Jay T. Last. 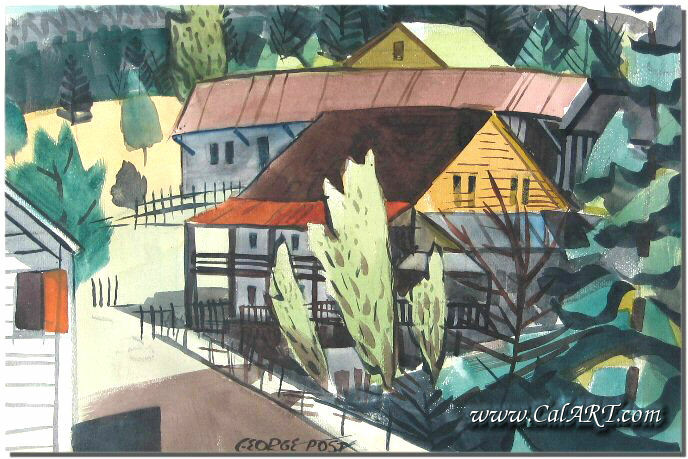 Copyright Hillcrest Press, Inc. 2002. 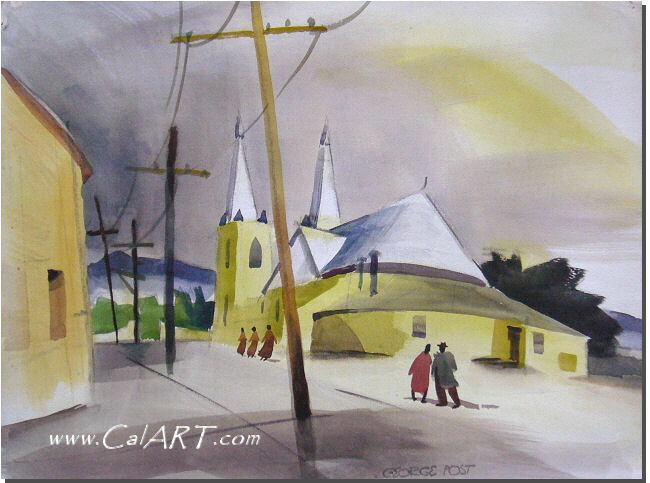 George Post was born and raised in Oakland, spent several years in Gold Hill, Nevada, then returned to California to live in San Francisco. 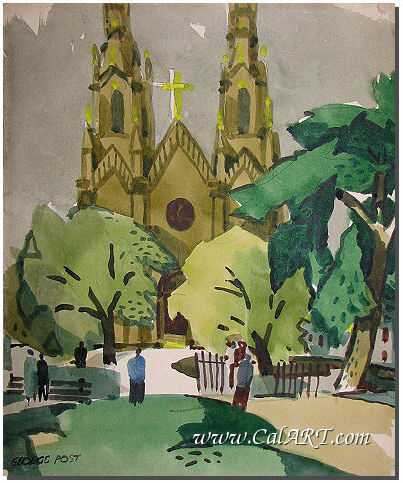 In 1921, he received a scholarship to study at the California School of Fine Arts. 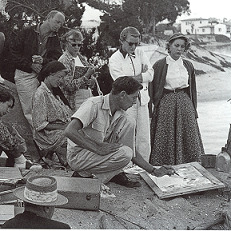 His teachers were Gottardo Piazzoni, Otis Oldfield, Ray Boynton, Spencer Macky and Constance Macky. 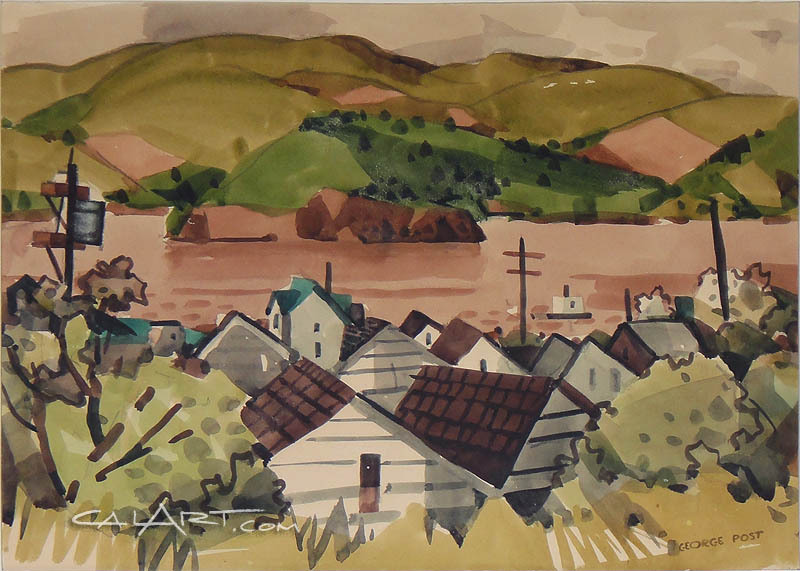 By 1930, Post was married and working as a commercial artist, while privately painting watercolors of San Francisco cityscape subjects. 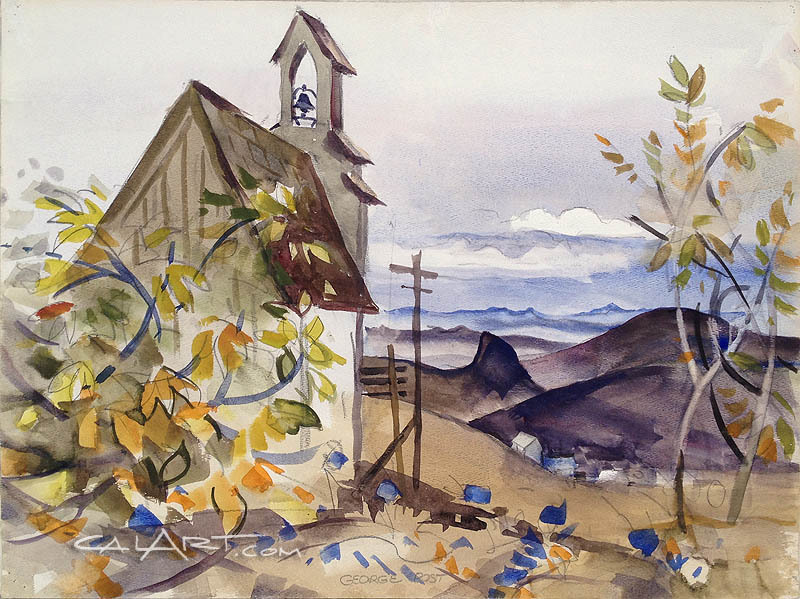 Although he received little instruction in watercolor at art school, he became very interested in this medium while viewing a show of outstanding watercolors by Stanley Wood in 1929. 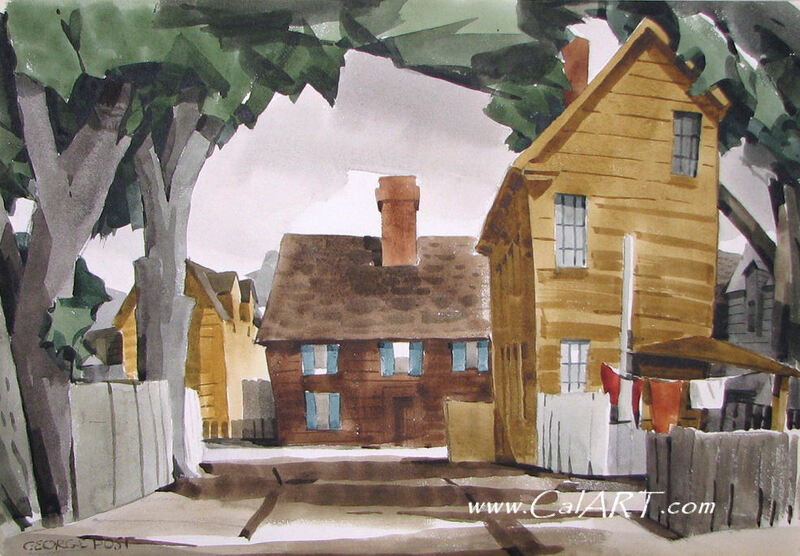 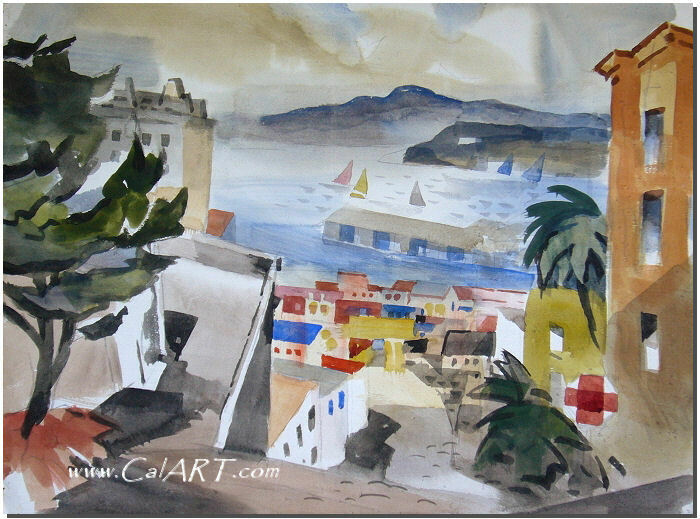 After that he became a committed watercolorist, producing works on a daily basis. 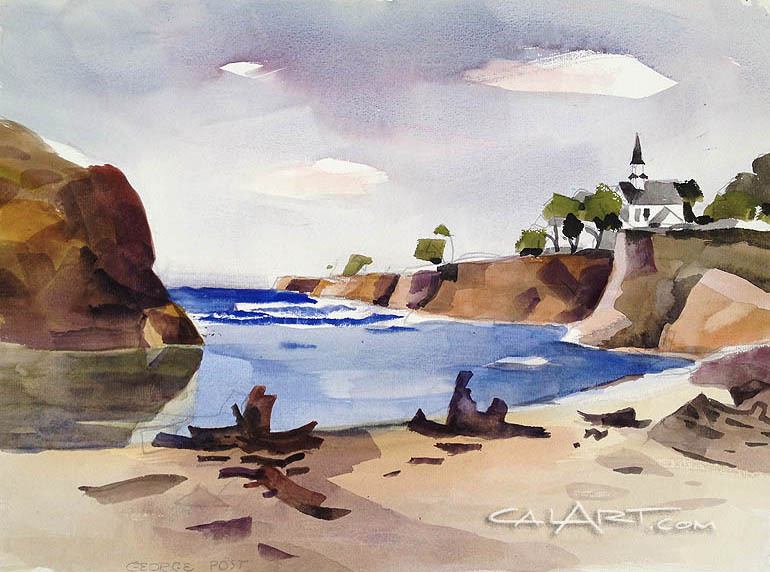 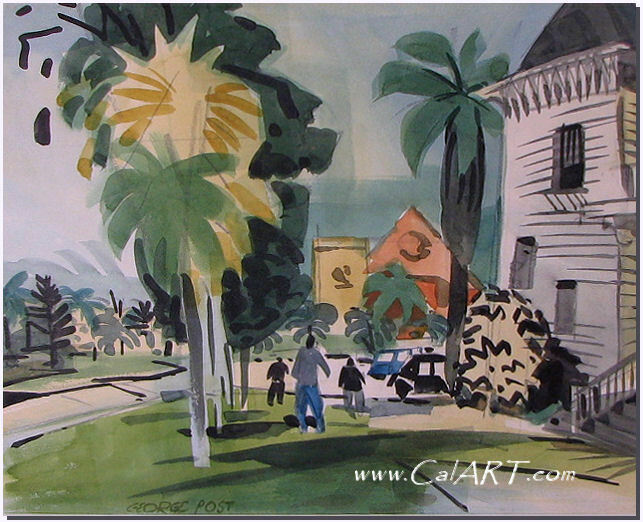 When California became known as the center of a new movement in watercolor painting, Post had already produced a large body of work and was prepared to do exhibitions at museum and gallery shows. 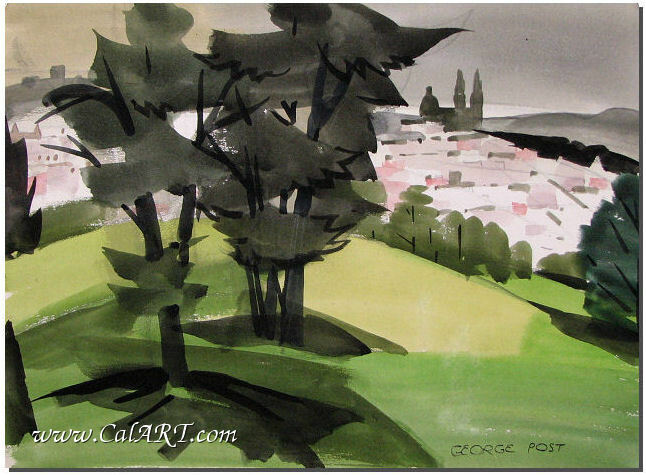 George presented one-man shows at the San Francisco Art Center, San Francisco Museum of Art, Oakland Art Gallery, Sacramento College Art Gallery, California Palace of the Legion of Honor, Sacramento Art Center and in a number of private galleries. 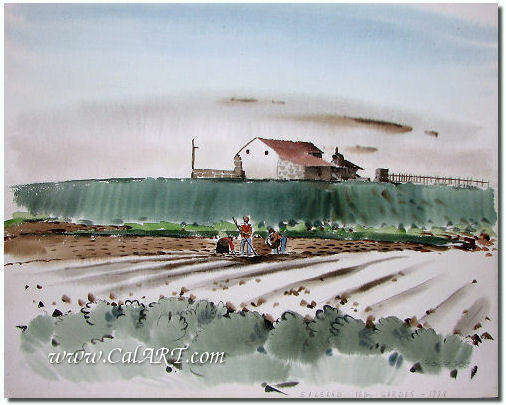 His watercolors done for the P.WPA. 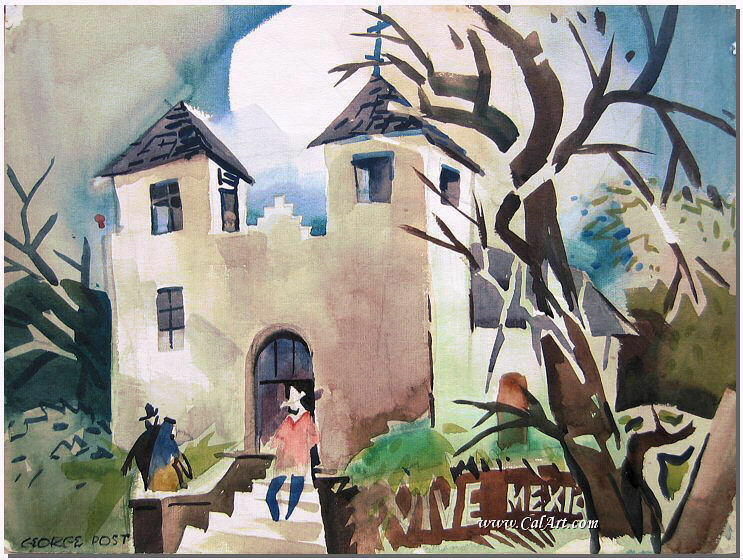 Art Project were exhibited at the M.H. 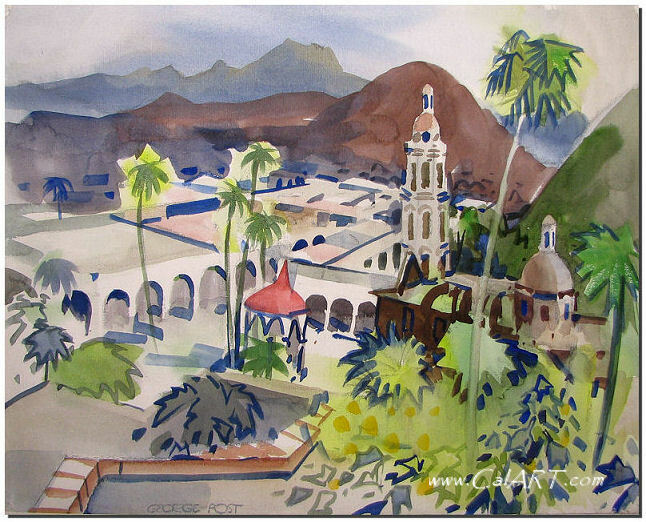 de Young Memorial Museum and a mural he painted in Sonora received positive reviews in the newspaper. 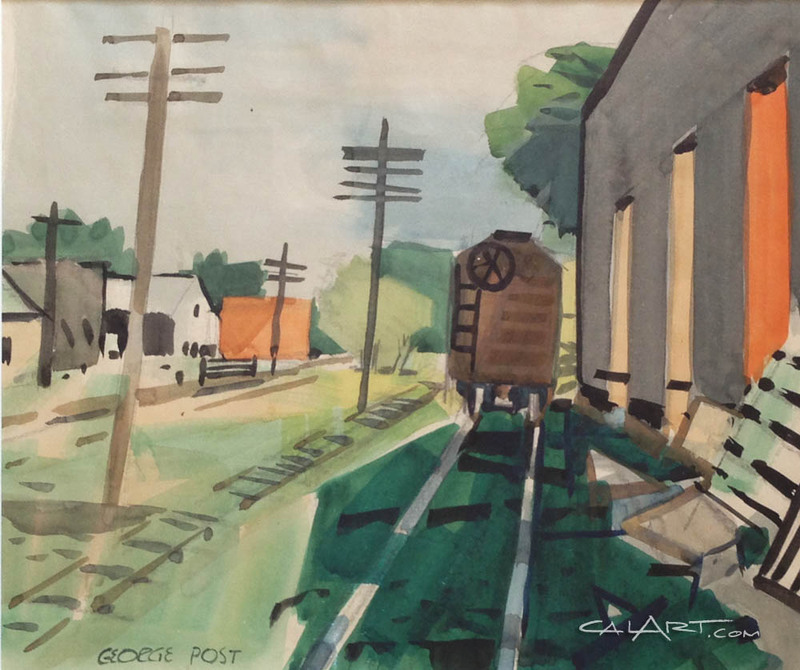 As a member of the California Group, George Post's works traveled in shows throughout America. 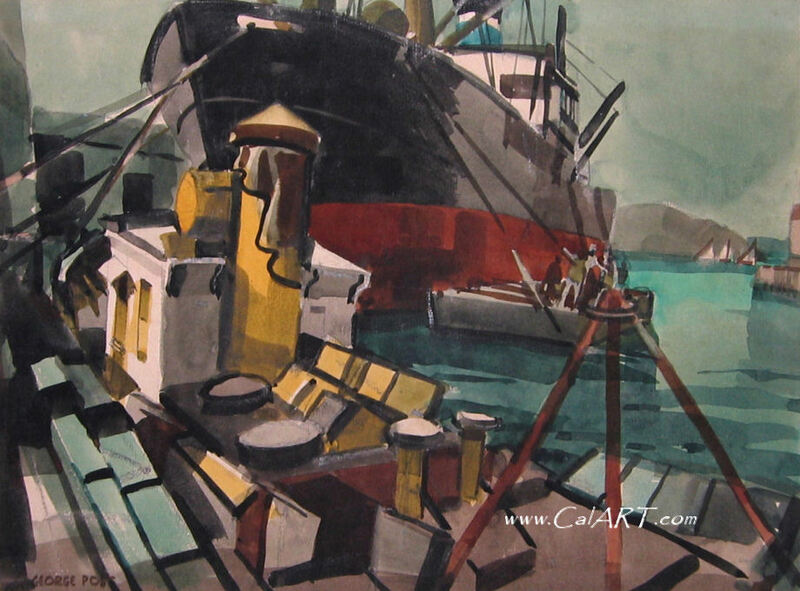 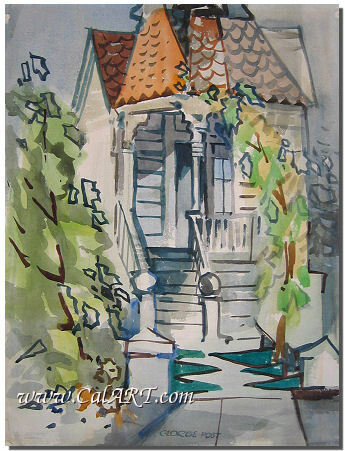 Post's watercolors, particularly the geometric abstractionist works done after the war, were well received in art circles throughout California. 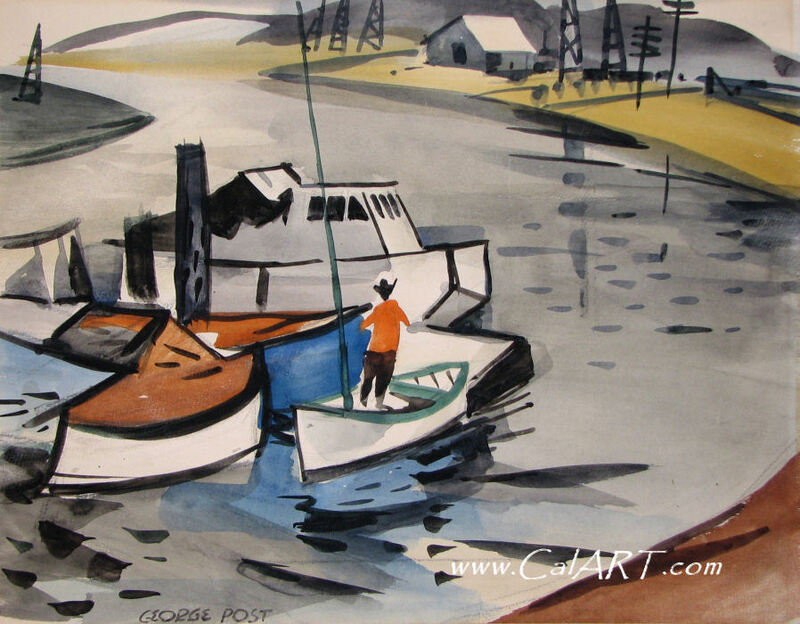 His style was modern enough to be exhibited in the progressive art shows and representational enough to be included in more conservative ones. 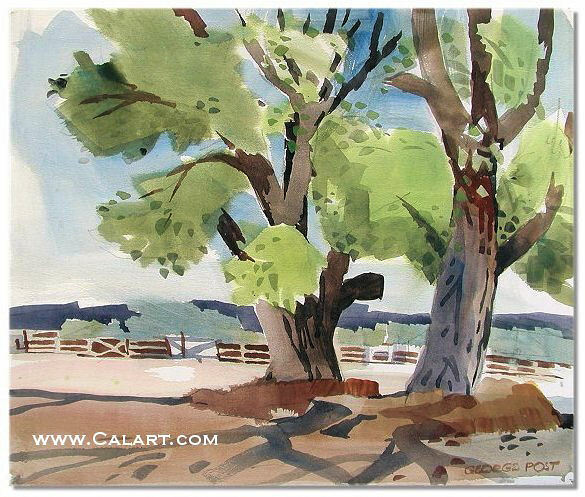 His goals were to capture the essence of design and feeling offered by the subject, rather than to produce a realistic picture of the scene. 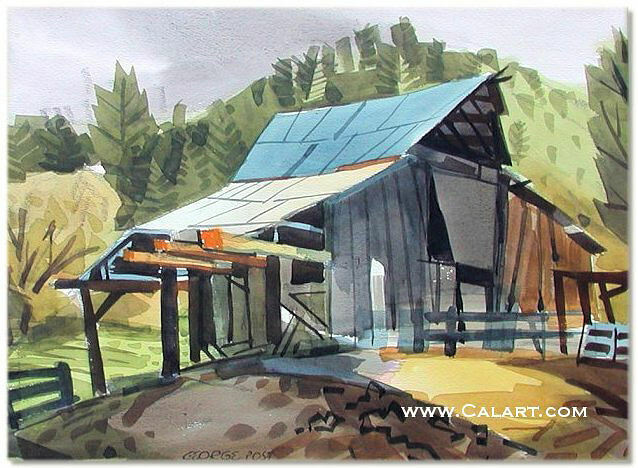 Although many of his watercolors look deceptively simple, they are masterfully composed, spontaneously painted, and have a creative use of shadow and light to establish a definite mood. 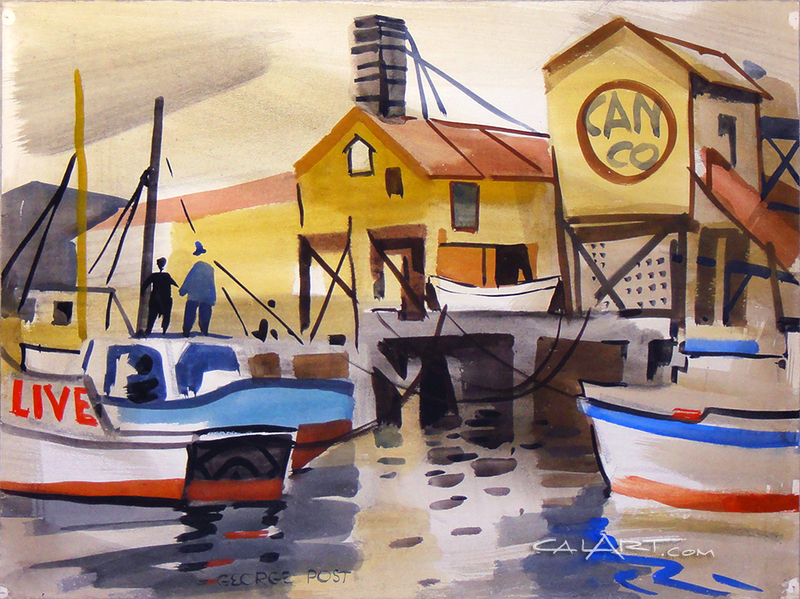 In addition to his painting career, Post also taught art for many years, in 1947, he was offered a job teaching at the California College of Arts and Crafts that only required him to teach two days per week. 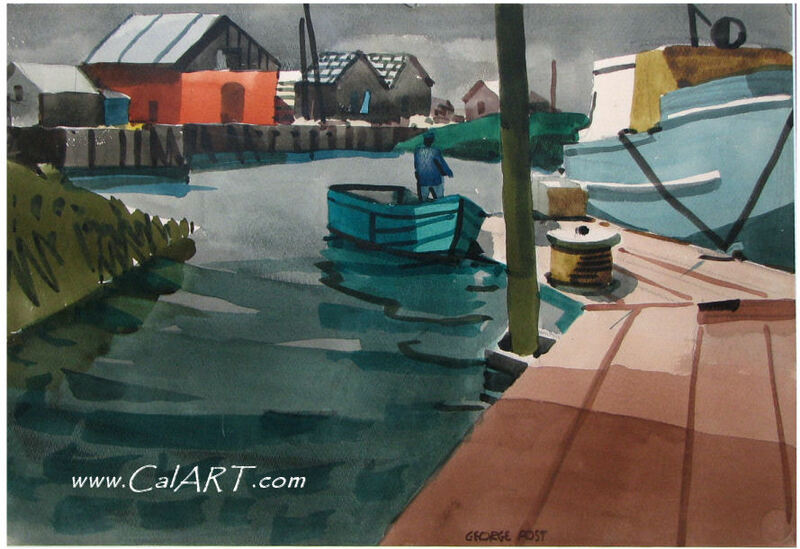 In the summers, he taught at the Brandt-Dike Summer School of Painting. 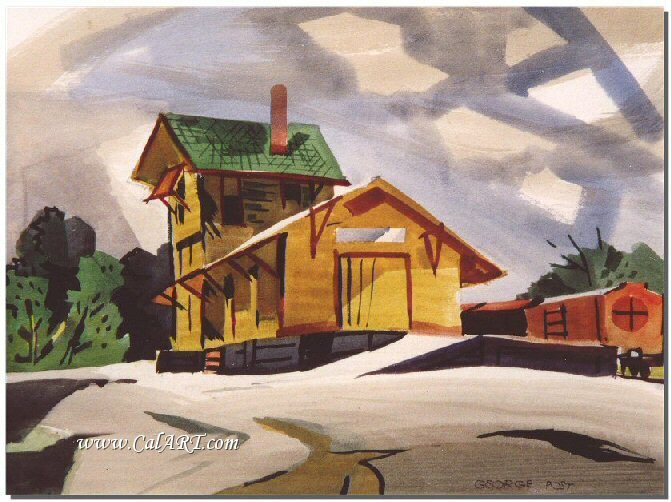 When they closed the school, he taught summers for the T.H. 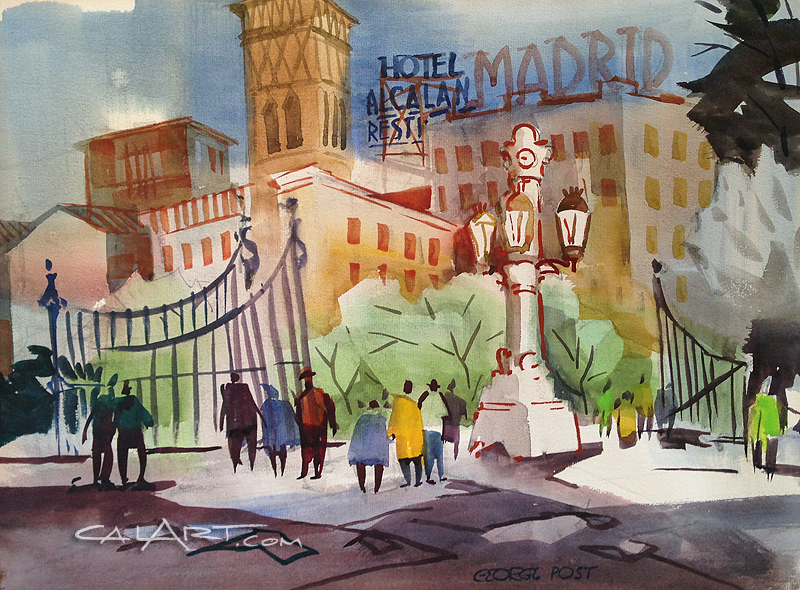 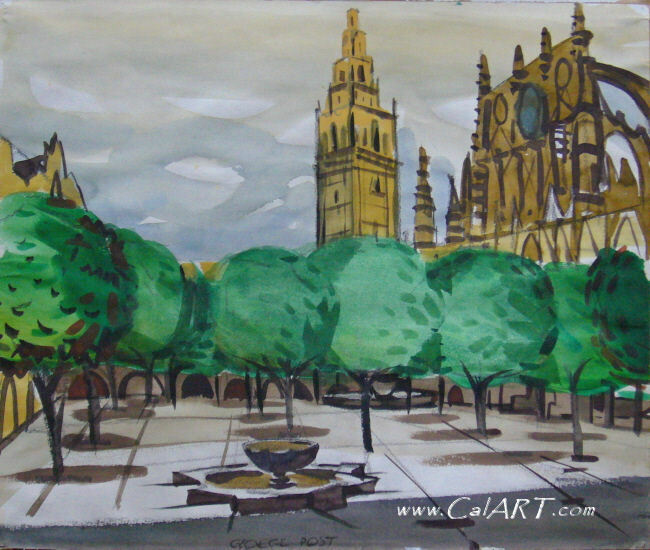 Hewett Watercolor Workshops at various locations around the world. 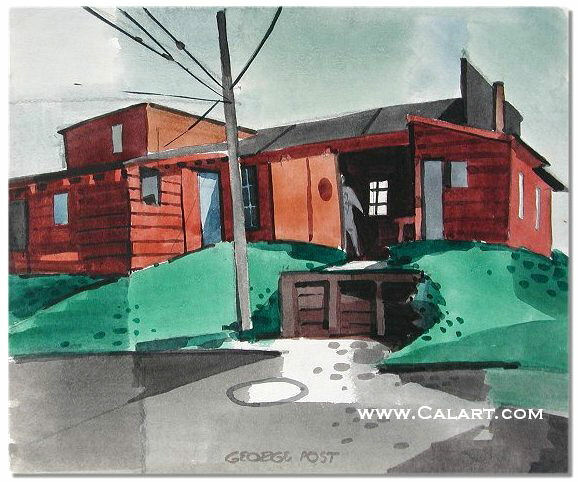 In 1991, a book titled George Post, which documents his life and art, was published by Hillcrest Press, Inc.
Interview with George Post, 1983.